♦ Myndskreytingar. Ég fékk þessa skemmtilegu mynd á Twitter í morgun! Bókabúðin Tales On Moon Lane fékk leyfi til að nota myndir úr Sögunni af bláa hnettinum til gluggaskreytinga. Bókabúðin er í Herne Hill í London og hlaut m.a. viðurkenningu árið 2011: The Walker Independent Children’s Bookshop of the Year 2011. Sagan af bláa hnettinum kemur út hjá Pushkin Press í London. Sjá einnig fyrri frétt um bókadóm. ♦ Illustrations. This image was on my screen via Twitter this morning: A lovely decoration in the bookstore Tales On Moon Lane in East London. Looks very inviting! This ambitious bookstore was chosen The Walker Independent Children’s Bookshop of the Year 2011. 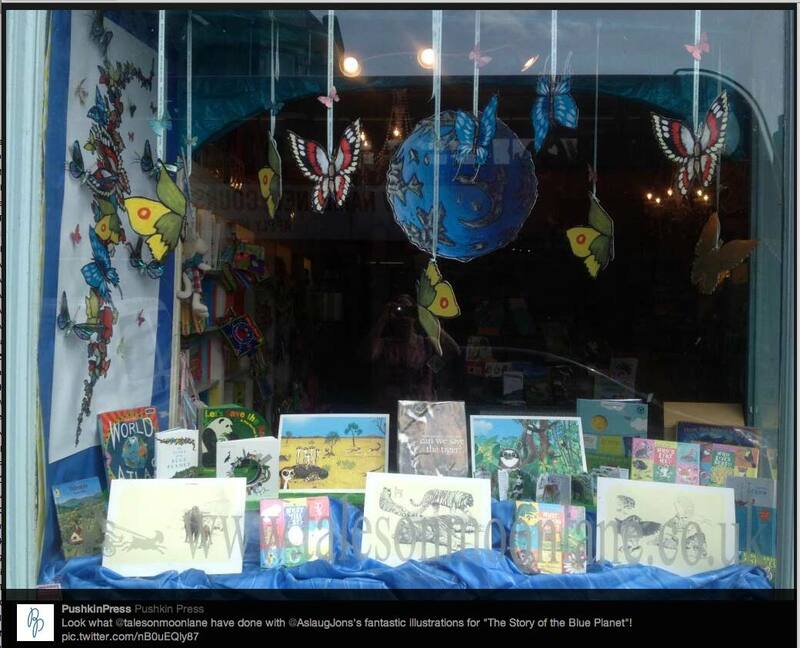 The Story of the Blue Planet is published by Pushkin Press, London. Reviews and more here. This entry was posted in bókaútgáfa | book release, myndlýsingar | illustration and tagged Andri Snær Magnason, Áslaug Jónsdóttir, illustration, myndlýsingar, Pushkin Children's Books, Pushkin Press, Sagan af bláa hnettinum, Tales On Moon Lane, The Story of the Blue Planet. Bookmark the permalink.